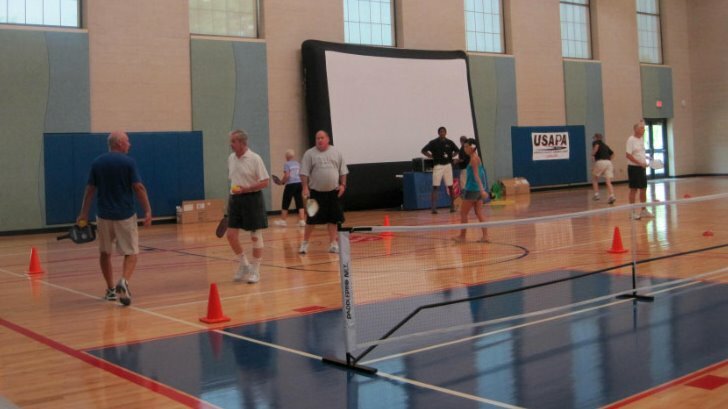 Just a followup on our pickleball demo at the Salvation Army's Kroc Center in Augusta, GA on Saturday August, 6th. 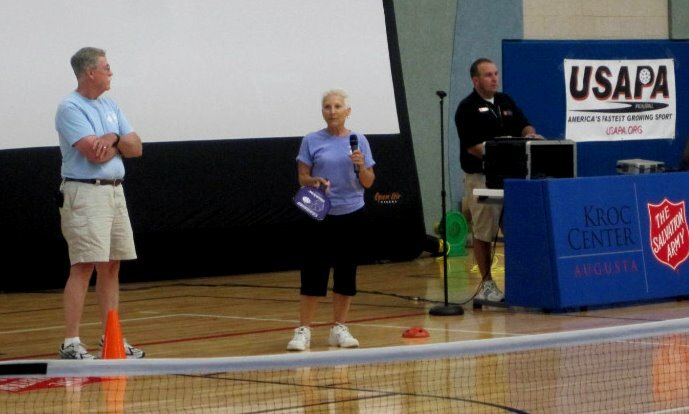 Eight players from our group in Aiken went to the Kroc Center to introduce pickleball. The Center had three net standards set up, a very large scree(approximately 16' x 20') on which they showed the USAPA Promotional DVD throughout the session. They also hung the USAPA banner nearby. Anthony Taylor, the Sports Director, introduced us and then we gave a brief summary of the history of the sport as well as the basic rules for play. We then demonstrated the sport on two courts. 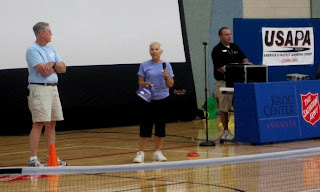 Afterwards, we invited people in the stands to take a paddle and join us on the three courts to hit the ball and get a feel for it.Anyone who gave it a try was given a goodie bag of promotional items/advertising donated to us by 6 pickleball supply companies. Even the Mt. Olive Pickle Co. sent us magnets and bookmarks to include! Everyone seemed to enjoy the experience....we had people of all ages try the sport, but most of them were younger players, who really seemed to like it. We have offered to go back to the Center to train some of the staff so that they can teach anyone who comes to play. Hopefully, pickleball will take off in this wonderful new facility! Hello, My name is Lewis Chestnut and I am wondering about how to get into pickleball. I have played tennis for many years and have grown a little tired of it and want to find something new but still with the skill and mechanics of tennis. I can be contacted by either facebook: Lewis Chestnut, or Email Lewis_Chestnut@yahoo.com. Thank you and play on. Congrats to The Villages Winners! Dog Days of Pickleball in Cherokee County!